Its design resembles the original archducal hat and depictions on coins of the archdukes Ferdinand I and Ferdinand II of Tyrol. It consists of a gilded copper circlet which rests ten triangular gables with precious stones and ornaments. It is closed with two arches surmounted by a globe and cross at the center. The copper circlet is hidden by the crimson cap which was originally turned up with ermine. The ermine has been lost over time and was replaced with silk in ermine pattern. Both the hat and the sceptre were probably made in 1602. Although the Tyrol was a county, the hat is called archducal hat since its ruler Maximilian III was an imperial Habsburg archduke, which is a higher rank than the count of Tyrol. He appears to have considered it unsuitable for his personal use after personal examination of the hat at Innsbruck in 1613. It was given as a votive offering to the church in Mariastein. ^ Lord Twining, Edward Francis: European Regalia, B.T. Batsford Ltd. London, 1967. p 141-142. Jakob Hutter, was a Tyrolean Anabaptist leader and founder of the Hutterites. 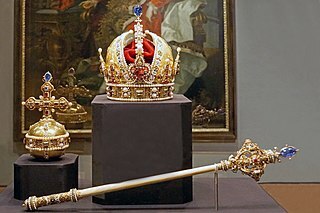 The archducal hat is the insignia of the Archduchy of Austria, mostly apparently symbolic and used in the heraldry and some portraits of Austrian archdukes rather than routinely worn. One late example is kept in Klosterneuburg Monastery. Mariastein is the smallest municipality in the Kufstein district in the Austrian state of Tyrol located 4 kilometers north of Wörgl and 11.5 kilometers southwest of Kufstein. Already a fifteenth century pilgrimage destination, it became more so after a local statue of Mary, which had been removed to Bavaria in the late seventeenth century was said to have returned to the church in Mariastein on its own. At the center of the community is a 42-metre-tall Wohnturm, a castle built in the fourteenth century atop a rock outcropping, and which contains 150 stairs. It is now a museum. Hasegg Castle is a castle and mint located in Hall in Tirol, Tyrol, Austria. Anna de' Medici was a daughter of Cosimo II de' Medici, Grand Duke of Tuscany and his wife Maria Maddalena of Austria. A patron of the arts, she married Ferdinand Charles, Archduke of Further Austria in 1646. They were the parents of Claudia Felicitas of Austria, Holy Roman Empress. Archduke Leopold Wilhelm and the artist in the archducal picture gallery in Brussels is a 1651 painting of Archduke Leopold Wilhelm's Italian art collection by the Flemish Baroque painter David Teniers the Younger, now held in the Kunsthistorisches Museum in Vienna. Archduke Leopold Wilhelm and the artist in the archducal picture gallery in Brussels is a 1653 painting of Archduke Leopold Wilhelm's Italian art collection by the Flemish Baroque painter David Teniers the Younger, now held in a private collection, but previously owned by the Rothschild family, which is how it came into the Kunsthistorisches Museum collection for 50 years after World War II in Vienna. Archduke Leopold Wilhelm and the artist in the archducal picture gallery in Brussels is a 1653 painting of Archduke Leopold Wilhelm's Italian art collection by the Flemish Baroque painter David Teniers the Younger, now held in the collection of Museo Lázaro Galdiano in Madrid. The Triumphal Arch is one of the best known sights in the Austrian city of Innsbruck. It is located at the southern end of the present Maria-Theresien-Straße, once the southern road out of the city.